The Birmingham Public Library's 19 locations are hosting programs to get patrons in the holiday mood. All of the programs are free and open to the public. Celebrate the holidays at our concert featuring Regi Yarbrough & Company. 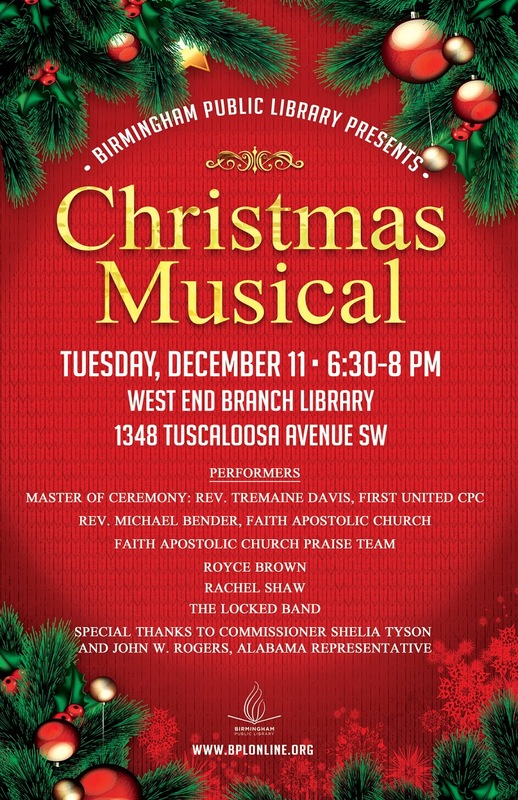 West End Branch Library Enjoy a free concert featuring many of your favorite holiday classics. Refreshments will be served. 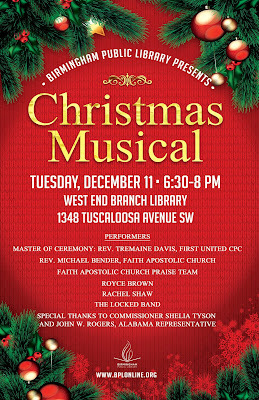 Holiday music performed by "Birmingham Baroque." Members include Alice Mazanec, cello; Suzanne Beaudry, harpsichord; Bonnie Furuto, violin; and Ken Kirby, flute/recorder. Open to all age groups. Style and talent collide in this tribute to Judy Garland, Cher, Carol King, Celine Dion, Dolly Parton, and other amazing women who shaped popular music. This retrospective of empowered hits will have you singing along. Registration required. Call 205-592-2082. Some of our other holiday programs (listed by library alphabetically) are below. To see our full list of holiday programs, visit the BPL events calendar and search in Event Category/Seasonal. Club Create: Fudge Brownie Steam Train, Wednesday, December 5, 2:00 p.m.
Come together to create something new! Join us to construct your own edible fudge brownie steam train out of store-bought goodies. Space is limited. Register in advance at the circulation desk, by calling (205) 226-4000, or through the BPL online event calendar. Holiday Children’s Movie Fest, Saturday, December 15, 2:30 p.m. Enjoy an afternoon of watching the old holiday favorites at East Lake Library. Light refreshments provided. Children, teens, and parents welcome! Board after the Holidays? December 26–28, 11:00 a.m.–1:00 p.m., 2:00 p.m.–4:00 p.m.
Come to the Eastwood Library to play some fun board games! Try-It-Out Tuesday: Wine Cork Christmas Ornaments & Crafts, Tuesday, December 4, 4:00 p.m. When the Holidays Aren't Happy: Coping with Grief, Friday, December 7, 11:00 a.m. Readers Are Leaders Book Club: December Holidays around the World, Wednesday, December 19, 3:45 p.m.
Get in the holiday spirit with the Readers are Leaders Book Club. Holiday Sweets and Treats from Chef Bryant, Monday, December 10, 1:30 p.m. Chef Bryant of K&J's Elegant Pastries in Alabaster will share her story and talk about her passion for cooking. Participants will get Chef Bryant's Christmas cookie recipe. Registration is required. Call 205-592-2082. North Avondale Library Chapter Chatters Holiday Party, Wednesday, December 19, 10:30 a.m.
Book club members will discuss a good book, food, and music. Christmas Gift Wrapping for Seniors, Friday, December 14, 10:00 a.m.
Let us help you wrap those last-minute Christmas gifts. Come and get in the holiday spirit by crafting your own ornament! We will have a special holiday treat to snack on while we craft. We will be showing holiday films the week of Christmas to get you in the holiday spirit! Bring a snack to share with friends while you enjoy your favorite movie. Holiday Card Making for Adults, Tuesday, December 11, 10:00 a.m.–12:00 p.m.
Make your own greeting cards for the holidays. The library will provide card stock, ribbon, stickers, and other items for you to create beautiful cards. Registration is required and limited to 15 adults. Holiday Coloring for Adults, Wednesday, December 12, 10:00 a.m.–12:00 p.m. Manage holiday stress by coloring. Create something special while enjoying the meditative process of coloring. The program is free but registration is required. Limited to 15 adults. Holiday Open House, Tuesday, December 4, 5:00–7:00 p.m. Enjoy refreshments and holiday cheer at the Springville Road Library. Kids and families are invited to meet and greet Santa who will be here to pose for pictures! Art with Ms. Trisha, Wednesday, December 12, 4:00 p.m.
Make a holiday masterpiece with Ms. Trisha. Elementary school age children are invited to visit the library to create a work of art. Please call 205-226-4085 to register. Titusville Library invites family and friends to join us for a Polar Express-themed movie marathon. Kids are encouraged to dress up in pajamas and enjoy light refreshments. The movie marathon will include The Polar Express, Arthur Christmas, Home Alone, and A Christmas Story. Holiday Cartoons Marathon, Monday, December 17–Wednesday, December 19, 4:00 p.m.
Come join us as we watch some of our favorite holiday cartoons and animation over the course of three days. Light refreshments will be served. Afterschool Holiday Crafts, Tuesday, December 11, 3:30 p.m.
Children create a make-and-take craft for the Christmas season.